SNORKEL on three reefs: Colombia, Palancar and El Cielo. CRYSTAL FUND boat with shadow. DRINKS: Water, soft drinks and beers. 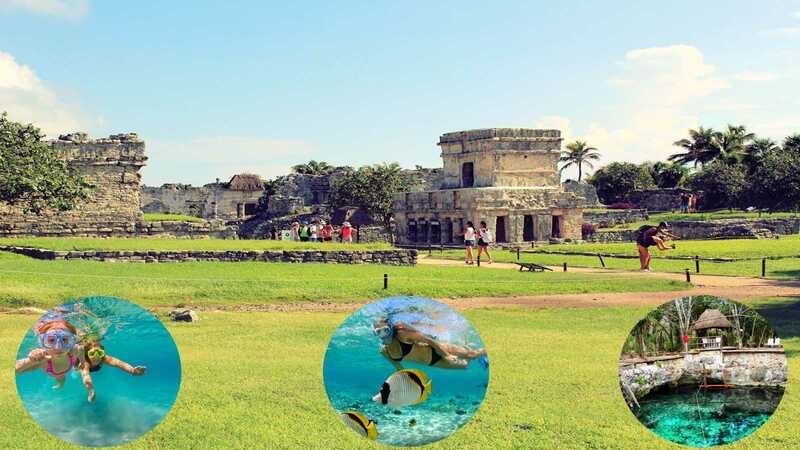 Come and enjoy the city of Tulum! Perfect place to get to know an interesting culture where you can admire the beauty of the Caribbean Sea. Cool down in the waters of the Zacil-Há cenote which means "clear water" in Spanish surrounded by a natural environment that will leave you impacted by the jade green color and its crystal clear waters where you can swim and snorkel. You will get to know the reefs: Colombia, Palancar and El Cielo, where you will immerse yourself in the crystal clear waters of Cozumel and explore the marine fauna and flora. It will be an unforgettable experience! so bring your water camera, these moments should be captured to share with family and friends! The coral reef is one of the biggest attractions on the island of Cozumel, and thanks to a glass bottom boat and the crystal clear waters of the Mexican Caribbean can be admired. The whole family can enjoy this activity and make their own adventure, while some people like to snorkel around the coral area with the bilingual professional snorkel guide, maybe others like to be on board the boat and admire the reefs through the glass, in the shade and have an instructive and friendly conversation with our captain while drinking a beer, soda or bottle of purified water (included). Federal Tax: $ 3.00 USD per person, is paid upon boarding. Transfer from your Hotel to the Cozumel Pier. $ 3.00 USD Federal Tax, Marine Park (paid at the time of boarding, per person). Transfer by ferry: Playa del Carmen - Cozumel - Playa del Carmen. Land transfer from your Hotel to the pier of Playa del Carmen. Bring cash and credit card: Memories and additional services. Recommended to bring: Sunglasses, sunscreen, towel, additional clothing and water camera. Do not carry heavy loads, in Cozumel you can find everything you need. Total duration of the Tour: 4 hours approximately. This tour operates every day of the year, the departure times are fixed. For our clients who stay at COZUMEL, they will be informed about the meeting point (does not include ground transfer hotel - pier). Total duration of the Tour: 2 hours. Departure times available: 11:00 a.m., 1:00 p.m. and 03:00 p.m., when making your reservation in the comments section indicate the time you are interested in, confirm availability or recommend an alternate schedule. Comfortable shoes that can get wet. $ 96.00 Juniors 3 - 9 Years.